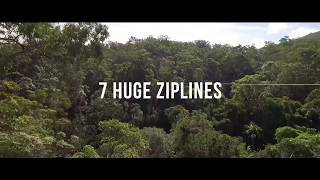 The Canyon flyer is one of the most extreme adventure attractions on the Gold Coast and is Australia's largest guided zipline canopy tour of up to 10 adventurers with two awesome guides. The tour, consists of seven huge ziplines that fly over Cedar Creek Canyon multiple times. As you cross Cedar Creek Gorge you get more than 60 metres high and get up to speeds as fast as 70 kilometres per hour! The zipline tour takes about three hours and also has a great four wheel drive experience as they take you from their reception to the start of your adventure. The Canyon Flyer is all about thrills, action, extreme adventure and getting the adrenaline pumping! Unlike their Adventure Park, there are no hard elements to go through, just insane ziplines all the way. This means its a great experience for all fitness levels and an adventure of a lifetime!